The day started out like any other in Gardenville. As the sun peeked through the hedges, the dew on the squash vines glistened, just as it did on the beans and tomatoes planted nearby. The bright yellow squash blossoms caught the sun in that certain way that gave them a “come hither” look sure to be irresistible to any passing pollinator. 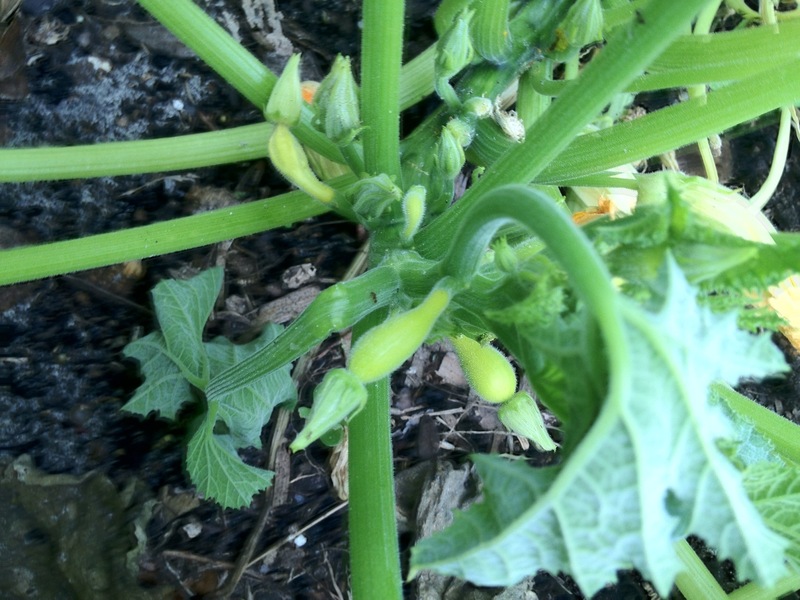 The young fruits were already beginning to swell and take shape, promising the yellow crooknecks a head-start of several days in front of their rivals, the nearby zucchinis, in the race to the dinner table. From all outward appearances, it was starting out to be yet another wonderful day in paradise for growing veggies. Alas, outward appearances can be deceiving. By the time the gardener strolled out for his customary midday garden check, it was apparent that a nightmare had come to visit Gardenville. The evidence was right there in the middle of Vine Street. Rather than find the usual assortment of minor garden-tending tasks, such as tying something here, snipping something there, or providing a welcome drink of water to a thirsty plant, the gardener found himself standing face-to-face with something much more sinister: the dreaded Melittia cucurbitae, otherwise known by its more descriptive term, [cue the ominous music] the squash vine borer. The symptoms were clear. Several vines had simply drooped to the ground, still attached, but totally limp, withered, and hopeless looking. No amount of watering would revive them from this kind of wilt. 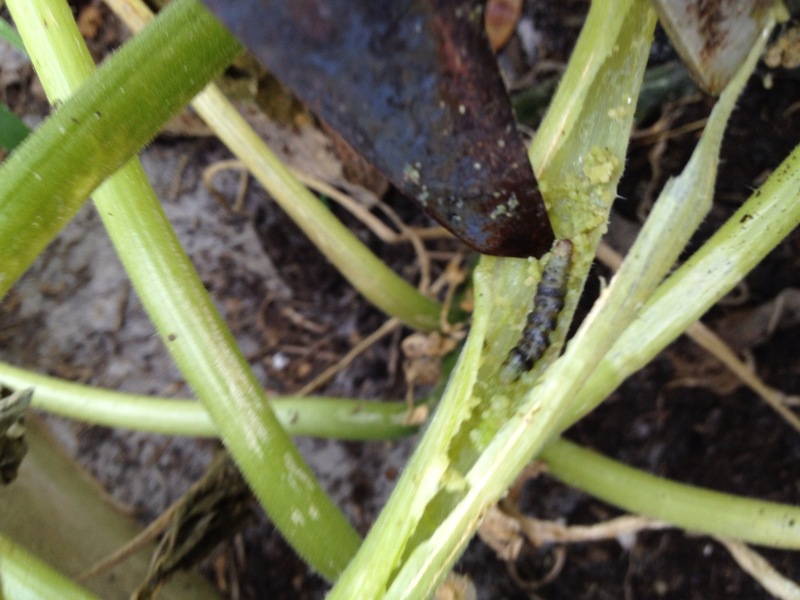 Upon closer examination, the telltale signs of squash vine borer were there — the translucent appearance to the affected stalks, the occasional small hole near the base, accompanied by an accumulation of gooey looking frass. A few snips and a slit later, and the offending organism was found. There it was — that inch long mass of writhing, wriggling larval protoplasm that spelled gloom and doom for any infected squash plant. The gardener’s heart sank. Despite my best efforts to deal with this pest, I eventually had to concede defeat. Melittia cucurbitae had won this round. My next planting opportunity for these varieties will be in September. I have until then to plan my strategy for dealing with this garden version of Freddy Krueger. 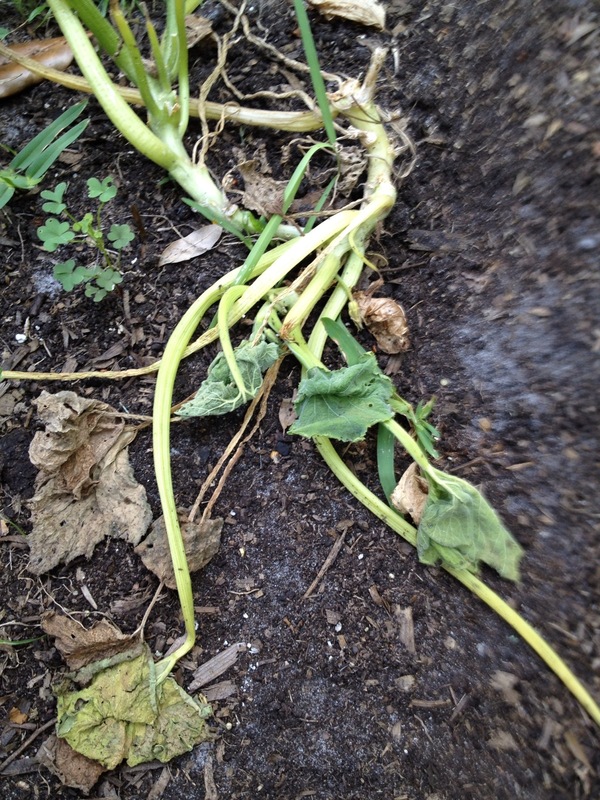 In the meantime, the space previously occupied by by yellow crookneck and zucchini will be planted in cowpeas, since they are not susceptible to this parasite and do well in Florida’s hot summer weather. As for any cravings for garden-fresh summer squash, my best bet will be one of the nearby farmer’s markets.